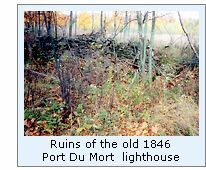 The first light designed to guide ships negotiating the eastern entrance of the Port des Morts passage was constructed on Plum Island in 1846. Complaining that the light was located too far west of the passage entrance to be of any use to shipping, various influential maritime interests lobbied he Lighthouse Board to move the light to a more easterly location where it would better suit its' intended purpose. On May 28 1858, title to the 3.5-acre island then known as Port Du Morts was transferred to the Lighthouse board for the construction of the new light station, and later that same year the Plum Island station was abandoned, and a new station reconstructed on Pilot Island. Without maintenance, the old Plum Island lighthouse quickly began to deteriorate, and by 1863 the roof had caved-in, leaving only the chimney and four crumbling walls. With continuing growth in vessel traffic through the Passage, in 1890 the Lighthouse Board recommended to Congress that an appropriation of $21,000 be made to construct range lights and a fog signal on the southwesterly portion of Plum Island to help guide vessels between Plum Island and the tip of the peninsula. Congress ignored the Board's recommendation until February 15, 1893 when an appropriation was finally approved, however no monies were appropriates for the project, and without funding, work could not begin. 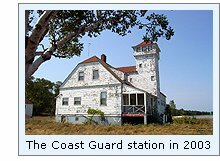 Finally, in 1895, as a result of a number or wrecks in the passage, the Life Saving Service requested that they receive funding for the construction of life saving station on Plum Island. With a double purpose planned for the Island, and on March 15 of that year Congress acted with the necessary appropriations for the construction of both facilities. 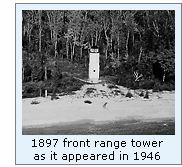 In August of the following year, a thirty-man crew was deposited on the island, and work began with clearing the thick forest for their work camp, and a large clearing between the planned locations of the range lights. Over the following four months, a barn, boathouse, docks, fog signal building and twenty five hundred feet of wooden walkways took shape. They also cleared a site for the fog signal and a connecting roadway. The crew built a barn, boathouse, and several piers. At the same time, they built the concrete foundation for the rear range light and began building the two-story brick keeper's dwelling. Finally on December 4th, 1896, with their work complete, the crew packed-up and abandoned the island for the winter. Chosen as the station's first keeper, Martin Knudson was transferred from Pilot Island, and exhibited the lights for the first time on May 1, 1897. 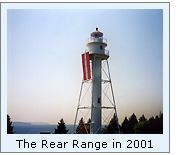 The front light was a virtual duplicate of the Front Range light built at Bailey's Harbor some twenty-seven years earlier. With a square base and an octagonal second story, integrated lantern room contained a fixed red Sixth Order Fresnel with a focal plane of thirty-two feet. The light was displayed through a small single window, designed to limit visibility to within a relatively narrow viewing arc to help vessels in attaining the range. 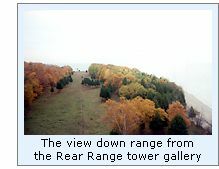 Some sixteen hundred feet to the north, the rear range light consisted of a white cylindrical tower containing a tightly spiraling staircase. Atop the central cylinder sat a circular watch room some eight feet in diameter with surrounding gallery, and an octagonal iron lantern room with its own smaller gallery. From the watch room gallery, four cylindrical legs reached out to the ground to provide support for the gallery and lantern room, equipped with a fixed red Fourth Order Fresnel lens. With a total height of sixty-five feet, the lens boasted a focal plane of eighty feet, and was visible from a distance of thirteen miles. Completing the station was a large duplex brick keeper's dwelling with a tramway for carrying supplies from a pier on the shore and a brick fog signal building equipped with a steam-operated siren. With the Coast Guard's assumption of responsibility for the lighthouses of the United States in 1939, the piers and boathouse were removed, and the dwelling was emptied, and the crew assigned to the light moved to share the Life Saving Station. The wooden front range light was replaced with a steel skeletal tower in 1964, and both lights were automated in 1969. The range lights now stand alone as they continue to guide mariners through the Passage. The Island is now under the stewardship of the United States Bureau of Land Management, and the vacant structures are deteriorating rapidly and vulnerable to vandalism. As a result, early in 2000, the Wisconsin Trust for Historic Preservation placed the Plum Island Light Station on its list of the State's Ten Most Endangered Historic Properties. David Robb was a Coastie stationed at Plum Island in the early sixties. In corresponding with David, he graciously offered to write his recollections of life on Plum Island. What resulted was a vivid recounting of life at the Plum Island station, Search and Rescue missions through the Door, and service trips to some of the offshore light stations in Green Bay and northern Lake Michigan. 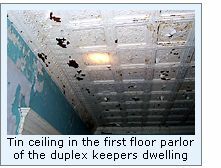 Click here or on the image of David to the left to read his recounting if his time on Plum Island. Click Here to see a complete listing of all Plum Island Range Light keepers compiled by Phyllis L. Tag of Great Lakes Lighthouse Research. Plum Island is inaccessible from land, and without access to your own boat, you there are two ways to see the Pilot Island Lighthouse. First, Plum Island can be seen from the Washington Island Ferry, when making the trip from the Door peninsula to Washington Island. For a closer view, there are a number of charter boat services which offer closer trips around the island. One of the most convenient and best is operated by the Shoreline Resort at Gills Rock. At $19.95, their narrated lighthouse cruise aboard their converted Navy P.B.R. includes close-up passes of Plum and Pilot Islands, along with views of Washington and Detroit Islands. Annual reports of the Lighthouse Board, 1890 - 1909. Email correspondences with David Robb, March 2001. July 2001 Photographs courtesy of . Photographs courtesy of Tom Williams, Keith B. Kotimko and Tim Sweet, and David Robb.